Is your home clean? It may sparkle, but the chemicals you’re using to clean it could be polluting it, too. The EPA estimates that the air inside our homes can be more polluted than outside! Learn how to clean better—and save money, too. When I was a kid, I knew the house was clean because it smelled like fake lemons and pine. But it may not have been as clean as my family thought. Indoor air pollution can lead to serious health problems like allergies and asthma; childhood asthma rates are now at epidemic levels, with more than seven million children affected, according to the Centers for Disease Control and Prevention. That’s one in 10 kids. So I’ve spent the last few years replacing those familiar from childhood with green cleaning products that I know are safer. Here’s how you can, too. Weed out anything containing ammonia, chlorine, nonylphenol ethoxylates (NPEs), triclosan, DEA, TEA, hydrochloric acid, sodium hydroxide or sulfuric acid. First to go are labels that show the words “warning” and “danger” or—god forbid—a skull-and-crossbones. Because if something is dangerous to put on your skin or eat, then why in the world would you want to put it on something that you touch or eat from? Check Earth911.org to find out where to safely dispose of these toxic products. Avoid artificial fragrances, which can contain hundreds of individual chemical ingredients, including phthalates that have been linked to hormone disruption. That one is tricky because it’s often listed as “fragrance” or even “natural fragrance,” but typically unless a label lists the components of what scents the product—such as lavender essential oil, etc.—then the word “fragrance” means it’s synthetically derived. Make a homemade arsenal of cleaners. Vinegar cleans surfaces and glass, baking soda makes a great scrub and olive oil leaves wood shiny. To my family, clean smells like vinegar—not fake lemon and pine. And that’s a good thing, because grandmother-approved cleaners like vinegar and these other household staples don’t contribute to indoor air pollution, but they still leave your house sparkling. Want more info? Check out my Guide to Going Green. 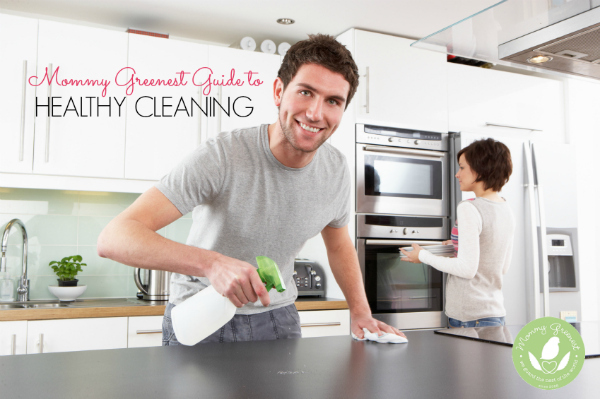 And happy—and healthy—cleaning! I have tried their tablets and still had some dirty dishes. I try to rinse everything well before loading. I will try using vinegar as a rinse aid. Thanks! You can try that, and also cleaning out the trap helps. But honestly, a few times a year I do use the conventional soap to kind of clean out the system. I just try to use the less toxic stuff most of the time. Thanks for sharing Laura! I use Seventh Generation and Bon Ami scouring powder. The one thing I keep buying that I know is bad is Cascade dishwasher tablets. I hand wash my kids stuff with Seventh Generation but the rest I just stick in the dishwasher. I’ve tried Seventh Generation and Honest Co tablets, but they don’t work well. Have you found anything that works? I’ve had great results from the Seventh Generation tablets, and I also use vinegar as a rinse aid. Have you tried that?